2012, We Hardly Knew Ye. . . It all seems like such a blur now. I don't keep a journal, so all I can do is look at my year in photos and say "Oh wow, I forgot about THAT." It's amazing how quickly a year seems to fly by, yet we manage to pack so much into it. Before I get too far into this, Troutrageous! laid out the ground rules for these kind of posts, so I'm going to go check the regs and come back. 1. No lengthy videos or photo slideshows of all of the fish you caught. In keeping with this I'll only be sharing a handful of pictures scattered throughout this post. 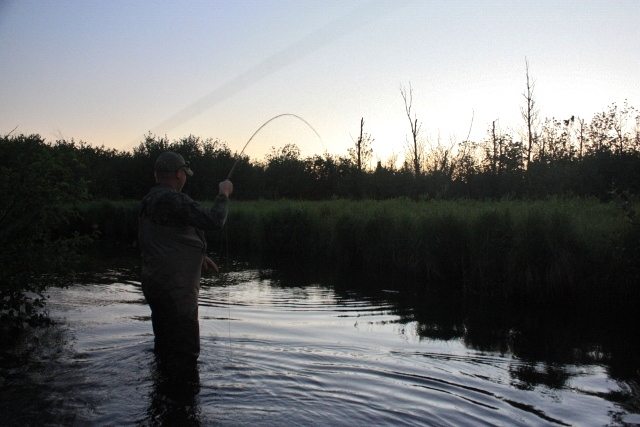 This shot below is one of my favorites, of Alex Cerveniak casting on a remote brook trout stream on a foggy morning in late summer. We didn't catch a lot of fish, but it was a great day spent on the water with a good friend and the lighting and detail are perfect. I met Alex in March and he has quickly become on of my favorite companions on the water, especially if I want to do an all day remote bushwhack in search of some lost grail. 2. Don't write too much. I blew off a dinner invitation from Tom Hazleton in order to interview April Vokey. Tom is such a good guy, that not only did he forgive me this slight, we have gone on to become great friends. Being that Tom is a customer service rep for Scientific Anglers and I'm a fly fishing blogger it could be easy to assume I have ulterior motives. My answer to such assumptions is a resounding "No!" Tom is the real deal- he grew up in northern Minnesota fishing the same kind of small backcountry brook trout streams that I did. Among our trips we went camping, night fished while listening to elk bugle, got turned around in the backcountry traveling from stream to stream, caught smallies and carp on the flats, and waded down a fast moving stream by moonlight to swing streamers for king salmon. Tom recently got married to his long-time sweetheart, but I sense we still have many adventures ahead of us. The photo below is of Tom out on the vast carp flats on what was a memorable weekend of camping, catching big browns at night during the Hex hatch, and stalking bronzebacks and carp in the afternoon. Easily the best weekend of summer. Tom between a rock and the blue sky. T! rule #3. No lamenting over your blog's future... Okay, I've already done this elsewhere, but I will state some new rules. No more posting just to post- either I mean it and feel it or it doesn't happen. This means that Monday Morning Coffee will continue to fade away. If it has been an interesting week and I have several unrelated items worth sharing then maybe, but don't look for it each Monday (I'm sure you aren't since I've let it slide for several months now). Also- No giveaways or other gimmicks to drive traffic. My blog revolves around my writing and photography. If that doesn't cut the mustard I'm not going to bribe you with freebies. Not saying I'll never do giveaways but I think you get the picture. T! rule #4. Insert a stupid pop culture reference in your post, even if it makes no sense. This was the year that Brandon Robinson (onebugisfake.com) moved to Michigan. Brandon's Facebook post is the reason I woke myself up with coffee and Gangnam Style all those mornings this year. Curses Mr. Robinson. 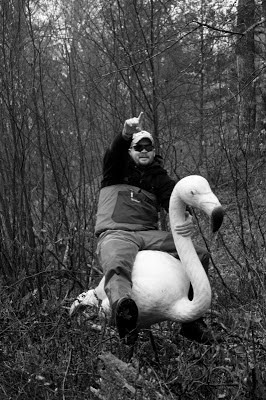 Rather than share some photo or video of Psy I believe this shot of Brandon riding a pink flamingo in someone's front yard says so much more. Giddy up! T! rule #5. Five is the magic number. All right Mr. 'Rageous! you get your wish. Here are my top five fishing trips this year in no particular order. 1. Fishing the Pere Marquette river in March with Alex Cerveniak. We drove several hours through the worst snow storm of the year. We didn't catch fish, but took some great photos. We stopped at BBT in Baldwin and bought copies of the new Drake issue with his work in it (how often does that happen?). It was the start of a great friendship. 2. 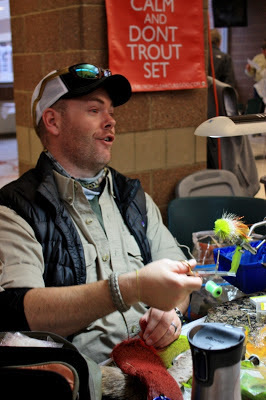 Camping and fishing the trico hatch (which didn't happen) with Mike Schmidt of Angler's Choice flies. Mike is a great guy to share a campfire or a river with. We were especially proud of this trophy log he caught on a 0 weight- it took both of us to land it. You don't get many moments like these on the river. 3. Fishing for brook trout with Alex Cerveniak and Jim Stuard. Alex mocked me for my choice of location, and the fishing was slow but the photo below is of Alex hooked on a twenty inch brook trout right before it broke him off. 'nuff said. 4. Camping and fishing with Tom Hazleton in June. I've already mentioned it above, but it was a fish bum weekend that I will long remember. 5. My solo trip to the UP on July 4 after brook trout. You can read about here on MidCurrent.com if you haven't already. 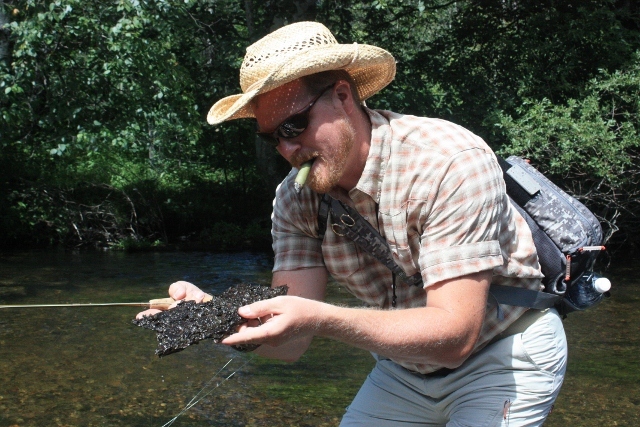 It was an epic trip- 3 streams, withering heat, beautiful fish, and a personal pilgrimage. Beaver Island in June ranks up there as well, but I had some tough choices to make. 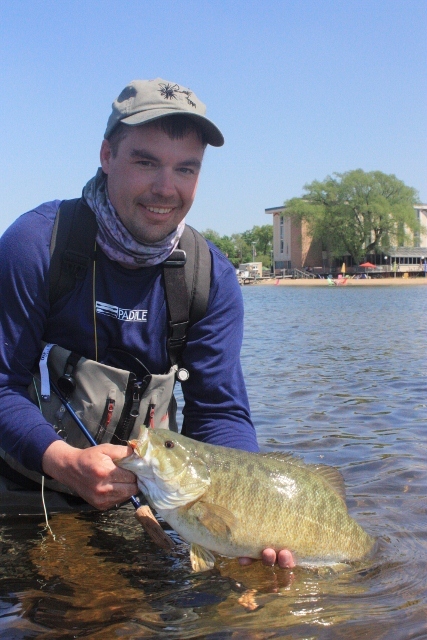 This was one of two 5 pound smallmouth I caught on Grand Traverse Bay in the spring. They were equally memorable but I had to pick one. Smallmouth in general were the fish of the year- I fished for them a lot, caught well over 100 of them and they vastly expanded and changed how I look at fly fishing. I've already started tying for next spring. I especially want to thank all the good people (besides the ones mentioned) I shared the water with this year- Jeff Kennedy, Ethan Smith, Becca Schlaff, Ethan Winchester, Don Mapes, Zach Ginop, Tom Menas, Steve Martinez, Brian Kozminski, and Greg Walz. You all were a pleasure to fish with, and it made the season that much more rewarding and interesting. If I left anyone out I apologize. According to the Jealousy Counter (top right on this blog) I fished 95 times this year. Will I beat that in 2013? Who knows and who cares. I still live in Northern Michigan, there are still many miles of stream and dozens of lakes I've never fished yet. Au revoir 2012 and welcome 2013. I wish you all the best and tight lines. I wrote this a few weeks ago when there had been a lapse of a couple of months between posts, but I still felt it was worth sharing. It's kind of amazing to come back here, look around, run a finger through the dust on the shelves. That line tells a tale, more so than the smudge on my finger tip, a lesson in contrast. Mortenson has been questioning my blogger cred. I suppose he has good reason. Have you ever asked the question "Who am I; why am I here?"? That's a bit dual pronged, but certainly related. In fly-speak we'd call it "an articulated question". I've been wondering why I do this, and where it is going. Is there a reason for me to post every Monday morning, even if I have nothing noteworthy to say, or worse, haven't given it the effort that you my readers deserve? Does the fact that I have "pro" status with several companies make me an industry person, or am I still an independent voice? Do I have to become a guide? Other questions bother me. Sure, I fish a lot and catch a lot of fish, but does that make me an expert? Hardly. I can barely cast, my tying is rudimentary at best, my knowledge of riparian entomology is sketchy, and honestly I am an outsider to fly fishing culture. I've spent too much time fishing on my own. 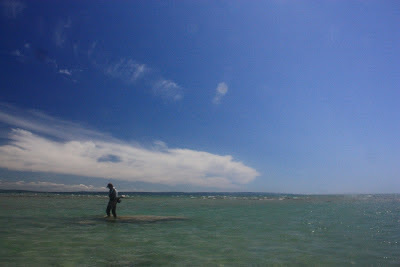 Fly fishing for me has always been a solitary pursuit, not a social one. I went to the rivers for solitude and solace, and I specifically avoided fishing at times and places that drew crowds. Loneliness on a river was comforting and welcome, in stark contrast to the feeling of loneliness at home. And so I fished a lot. 5 days a week for a couple of years. I got to know my rivers here better than anyone except Zach Ginop, who is a better angler and tyer than me by a long shot, and also 20 years my junior. It's a good thing he can't write. He's one of the best people you could ever spend a day on the river with. He's been voted (by me) Most Likely to Get His Flies Into the Orvis Catalog. Whatever you do don't fish with this guy- Zach in action. I left private life at about the same time as most of you. I am of course referring to the current Facebook era. In pretty much one fell swoop I got a Facebook account and then started blogging. I never thought anyone besides a couple of my close personal friends and family would ever follow anything I did, but these days they are a small minority of my followers. I'm getting a kick out of the current rash of "privacy" and "copyright" posts on Facebook. All of you- this is the internet era. I can copy and paste anything you post. I can download your pictures. When you clicked "I Agree" on Facebook's (and every other online social media) terms you gave them permission to pimp what you're posting, and never mind the fact that it allows me to download and use it, right or wrong. If you don't want to share it, don't post it. Sharing means exactly that- you are splitting your cookies n milk with me. Thank you. Sharing my solitary pursuit on social media resulted in a schizophrenic split- this is what I do alone, for all of you to see. Blogging exacerbated the chasm- this is what I do alone, please follow me. I am still exploring this rent in my psyche. I've tried hard not to give up river names and places, but at one point I fished a favorite spot that, judging by the untracked snow had not been fished in several days. I did a small blog and social media post on my successful fishing, only to find 6 cars there the next day. Coincidence? Possibly, but it still was an odd feeling. At the end of this day I still feel it is worth doing. I'll continue to hold everyone at arms length even as I continue to share my adventures. I'll continue to write. I have some fresh inspiration. Writers will always be lost and questioning souls. If you're wondering what Limbo is like, become a writer. It's not so bad- at least we have an outlet. Let's say you're a salesman. A good salesman. You live in an Austin suburb, own a comfortable house, have a lovely wife and 1.7 children. You're trapped in the soulless hell of plugging your company's widget business to business and are on yet another business trip. You have a golf handicap, fashion sense, are quick with a joke, and you bury your colleagues when it comes to what matters- selling. 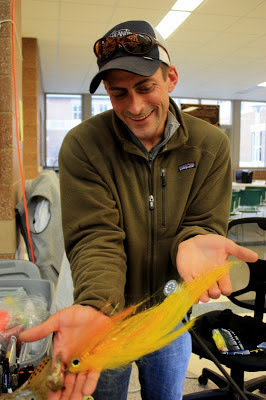 What your coworkers don't know, is that you're a closet fly fisherman. That's right, several times a year you take a long weekend or even a week, tell your colleagues you're heading out to visit family or going camping or whatever, when really you're taking the long rod to your favorite waters to fish your species of choice. Up until recently you've spent the first half day of such trips re-learning how to cast. But you're a good guy with impeccable taste and married the perfect woman. How perfect? She bought you the Redington Form practice rod as a gift. And here you are on a business trip, you've flogged your product successfully for the umpteemth time and now you are actually excited to return to your hotel room. Why? Because you get to spend the evening casting your Form rod at Wolf Blitzer's forehead. Just remember he deserves it. Part of me thinks that the Form is just a devilishly ingenious way to play with cats and small terriers. Imagine perfecting your casting form while Fluffy and Kibbles chase the orange yarn fly- that's right, your Persian could make you a better fly caster. That Yorkie could make you stop your back-cast on a dime. 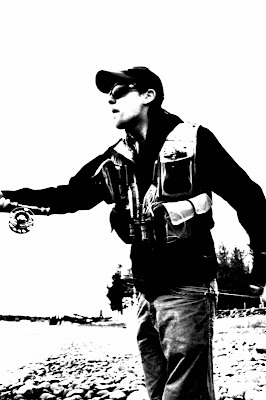 My snarky sense of humor aside, one of my biggest gripes each spring used to be that I had gotten rusty at my casting and would spend the first outing or two thrashing around like a walrus trying to haul out on the ice. It would have been nice to have one back then. The Form is compact enough that you can cast it indoors- it's all of 50 inches long with a thirty foot long Rio custom line and a yarn "fly" attached. One of it's ingenious features is that there is no attachment point for the line. This let's you hold the line with your rod hand, performing a normal cast OR you can hold the line with your free hand and guess what? Pretty soon you're double hauling like a pro. 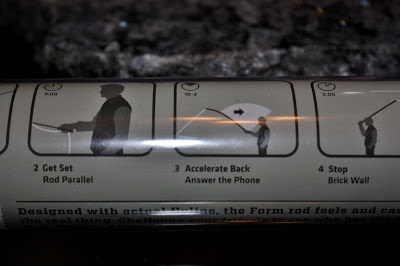 The Redington Form rod is a two-piece rod with a nice carrying case that has some rather ingenious casting instructions on the side ( Did you ever think the phrase "Answer the phone" would make you a better caster?). It even has one of those nifty QR codes on the side that will direct you to Redington's site for instructional videos etc. I have to say that even though I struggle less and fish more than I used to I still play around with this thing as it is a lot of fun to cast. I even got out my three weight line and threaded it up, just to see if it would cast a real fly line. I got fifty feet out of it. Next spring my buddy Zach and I are going to take it out for brook trout. There's no reel seat but trust me- we'll figure it out. The Redington Form rod retails for $39.95 and makes an excellent gift for the fly angler in your life. Or maybe for your Yorkie. I'm driving home, post-fishing. It’s dark, and the fog is thick. 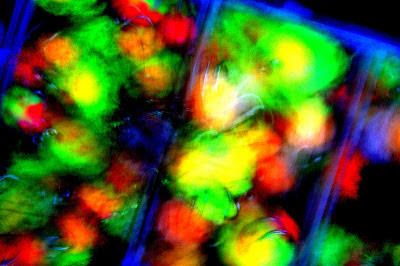 I have some psychedelic music playing on the radio, Olivia Tremor Control. The music ebbs and flows with strange rhythms and harmonies, the kind of music you would expect the Northern Lights to sound like if you were on 'shrooms. Bigfoot or a Yeti could cross the road at any moment. I wouldn’t be too surprised if I ran over the Mad Hatter tonight. 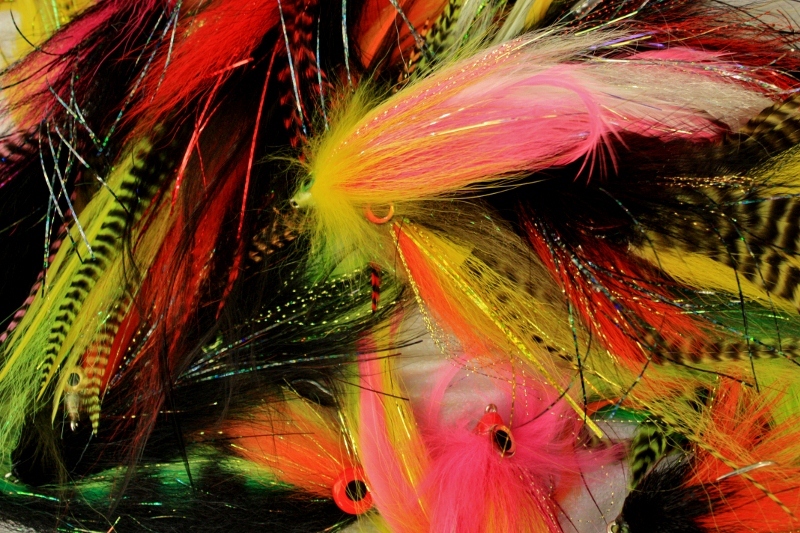 Fly fishing is my LSD. 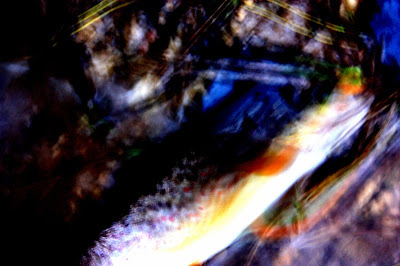 The river is a shape shifter, and fish appear and disappear like so many apparitions. Sometimes they wind up inexplicably in your hand, all vibrant colors and breathing vivid spots, other times they are just a shadow, a swirl in liquid silver, a tail or a fin that appears for an instant before disappearing, a mere figment of a fevered imagination. I can say that with confidence, and who could prove me wrong? It was my vision, not yours. I’m standing thigh deep in the cold swirling waters and cold swirling fog while cold swirling clouds pass overhead, and white swirling snow birds perform their own living blizzard in the fields. What month is this? My mind tells me it’s December, but the temperature feels more like April. The drumming of a grouse nearby settles it- It must be April. How many times have I been here? I don’t know. When was the last time I caught a fish? How many times have I tied this knot? How many times have I tied this fly? It all runs together in a house-of-mirrors mind trick, until even the faces of my friends run together, like a fire has broken out at Madame Tussaud’s. Was I with Phil or Bill the last time I floated the Pigeon? Was it ’04 or ’05 when I last fished the Harmony river? Have I been to Alaska? Because it seems pretty real. But it is not real. I’ve never been there. I know this. I’ll just have to keep reminding myself of that fact, despite my memories of fishing the dog salmon run on a braided gravel flat. I’m flogging the water pretty hard. Missed the first fish. Then another. 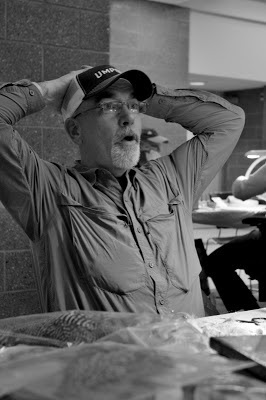 I get another of those disjointed moments when I hook up on a fish while trying to cross the river with my line trailing. Two head shakes and it’s gone. I’m going to have to give up fly fishing- it’s messing with my head. Childrens voices echo in the fog. I can’t make out what they are saying. Sometimes they sound happy sometimes they sound sad, irritable, plaintive, whiny. I used to have a repetitive dream that was very similar, but the voices were adult voices, and they were always angry. does this look like a Becca Schlaff painting or what? I make my way upstream, fishing the familiar lies, but they have all changed. I’m of the opinion that salmon have at least as big of an impact on a river as beavers- none of the holes are as they were last year, some are missing entirely. It’s like fishing a different river. I have to learn each run and hole anew. It's disorienting- the river looks the same, but something fundamental has changed. I miss several more fish before finally hooking up on a brown trout. It’s a small fish, but it’s colors are shocking and vibrant against the muted tones of the river in December, another hallucination in a monochrome world. Two runs up I miss a fish on the first cast, but as my rig drifts past me a spectral form materializes off the dark bottom and turns in a swirl. I pause a second before setting the hook; it’s no surprise when a foot-long rainbow comes to hand. I saw this coming before it ever happened; I have willed this fish into existence through an act of lucidity. I caught two more fish before the failing light blended all the shapes and colors back together, and the only reality left was the trail out, then the headlights of my car on the road. 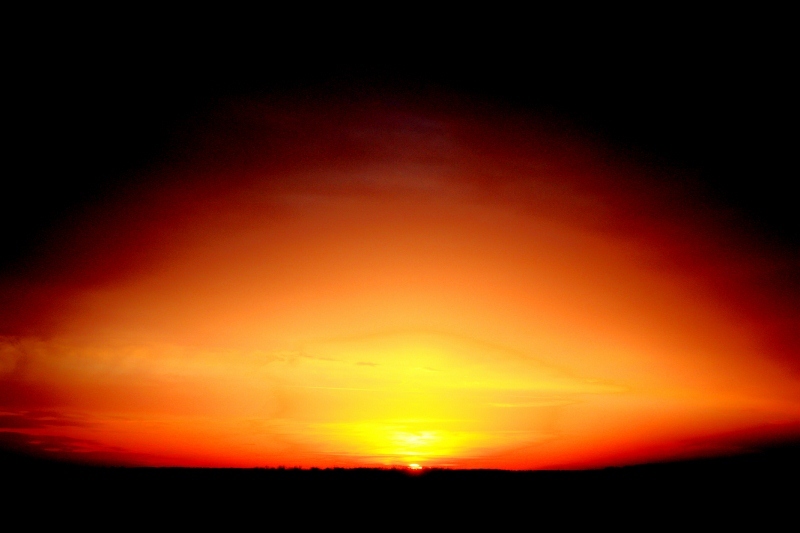 The world came to an end by the simple cataclysmic act of the sun setting. I head home to heat up my dinner and wait for the world to reappear miraculously tomorrow. I’ve never been into drugs. For me the river will have to do. I went to the FFF Great Lakes Council Fly Tying Expo in Holt Michigan today- down and back, which entailed a 3:30 am start, 8 hours of driving and a full day at the event, all to take in the work of some great fly tyers and artists. With about 80 tyers in attendance there was no way to meet or talk to everyone, and with a lot of great friends old and new there it was hard to get very far, but here's some photo highlights from the show. 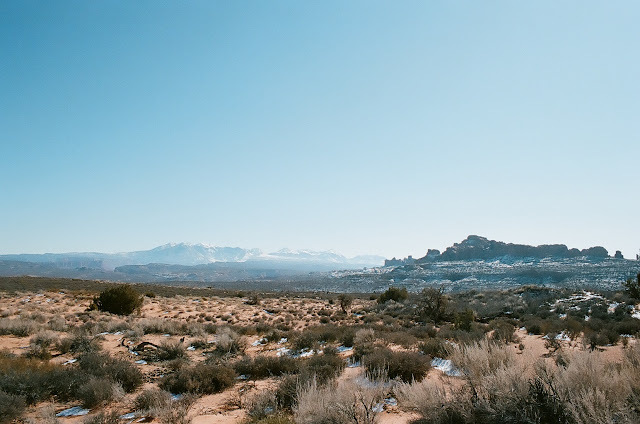 I traveled with Alex Cerveniak, Brian Kozminski and Ethan Winchester- great guys to share a road trip or a river with. Alex was one of the tyers. Here he is whipping up Intruder patterns. 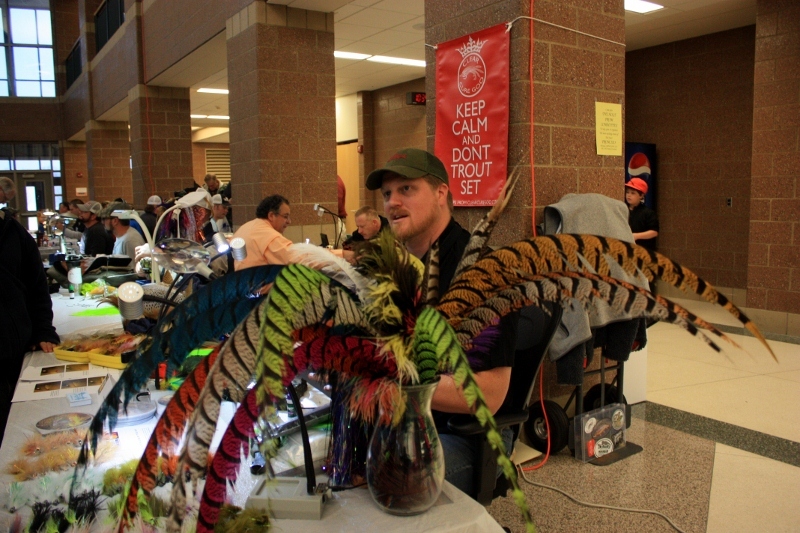 It was nice getting caught up with Lou Burhart of Brack Hill Tackle. Lou is always a lot of fun to talk to. He invited me to fish with him next week at his cottage on the Au Sable, which I sadly had to decline- work. Lou is a fantastic tyer of traditional salmon flies and maker of bamboo rods. 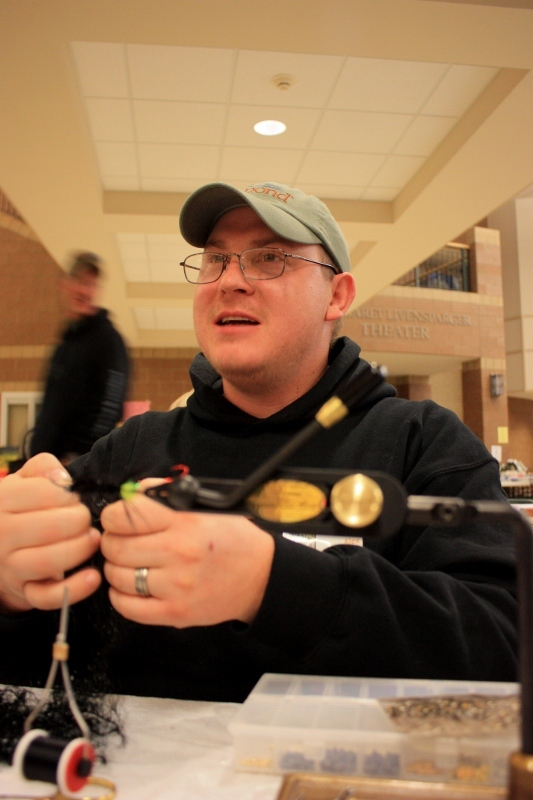 Here's Mike Schmidt of Angler's Choice Flies, a good friend. His table struck me as funny, as I wasn't sure if I was looking at a tyers desk or had walked into a Jo-Ann Fabrics. I have to bust his chops whenever I get the chance. This is Facebook friend Matt Svoboda. I'm not sure if he has a fly related business as I forgot to look for a card. He's certainly a good tyer. Matt- thanks for all the encouragement about my writing and blog, I really needed it. I'm glad someone gets my sense of humor. 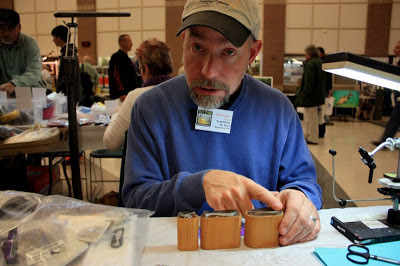 This is Chris Soule of SouleFly Productions. 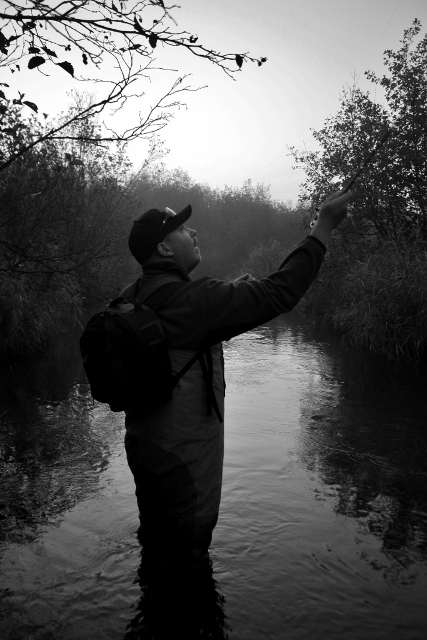 Chris is always fascinating to talk to as he always gets into the intricate details of why a fly works from both the perspective of the fish and the tyer. It's that kind of information that makes you a better fisherman even if you don't tie. For some reason this shot of Bear Andrews works in black and white. We had a great conversation, and I hope we get to wet a line some day. Jeff (Bear) shares the same passion for brook trout as I, and he chases them every year in Labrador and Ontario. I hope to join him some day. Tommy Lynch, The Fish Whisperer, doesn't know this, but I've taken to calling him The Professor behind his back, as he is the walking encyclopedia on big brown trout. 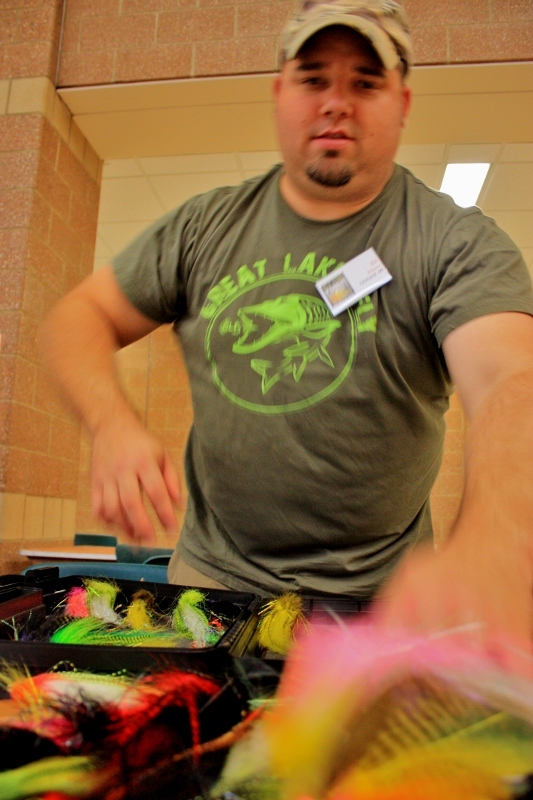 Here he is tying flies big enough to catch muskie- for browns. This is Alex Lafkas of Old Au Sable Fly Shop. We had a lot of fun taking trophy shots of this giant brown trout streamer he tied. He got it on a 3 inch sculpin pattern. 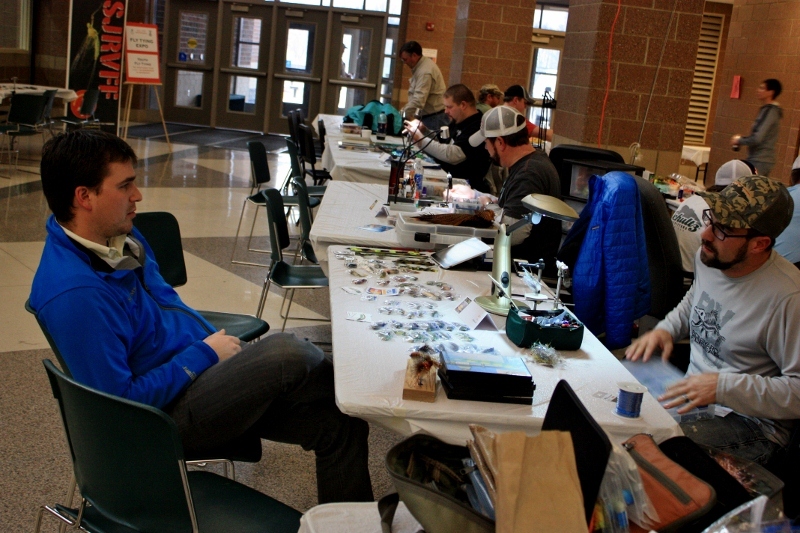 Here is Ethan Winchester talking with Matt Erny of Streamers Fly Fishing. 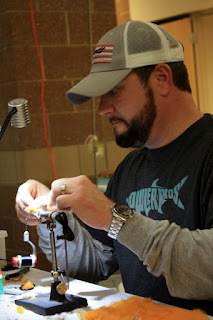 Matt is an excellent tyer, and it was great to finally put a face to the name of someone whose flies and fishing I have admired for a long time. Tommy Lynch again. What can I say, we had a lot of fun with the grip n grins. Eli Berant of www.greatlakesfly.com. It was great to finally meet this guy. He doesn't know it, but I've been admiring his flies from afar. 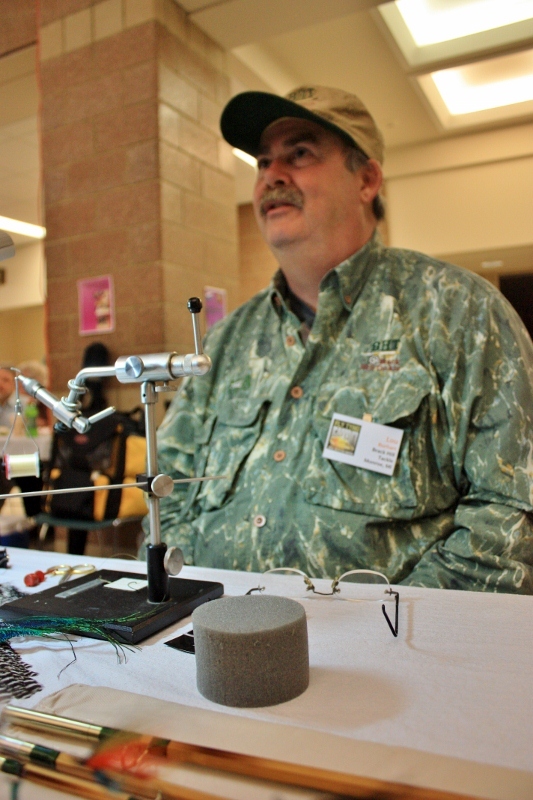 He is a muskie specialist and if I'm right, I believe he said he had 39 feet of flies on his table. This shot says it all- everything I love about flies and tying. I want to thank everyone I met and talked to today, but especially Charley Vee (I think it's VanHusen, but that's his Facebook handle) Matt Svoboda, Kyle Maki, Justin Keene and a couple of others who didn't give me their names for seeking me out and letting me know how much they enjoy this blog. It was a shot in the arm. If you don't see your name or pic here I'm sorry- I didn't take enough photos, and didn't get to talk to everyone I wanted to, but to all of you I want to say thank you. Keep up the great work, and I look forward to seeing you all in the future.